3 - 7 years. 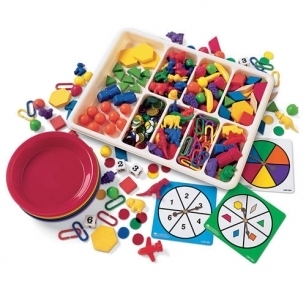 This comprehensive manipulatives set features more than 620 color-coordinated sorting items and Super Sorting Activity Cards. Set contains six sorting bowls, heavy-duty eight-compartment tray, number cube, three spinners, plus Friendly Farm® Animals, Mini Motors® Counters, Fruity Fun™ Counters, Link 'N' Learn® Links, pattern blocks and transparent counters. Teaching Guide included. Tray measures 14 1/4" x 11".